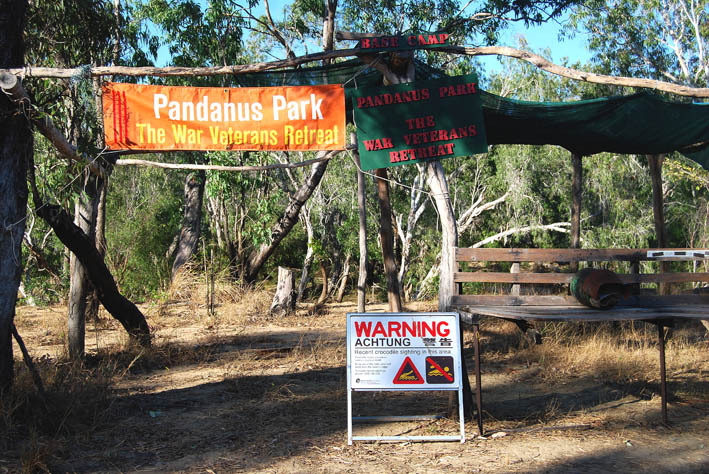 Pandanus Park is located on the banks of the Normanby River near Lakefield National Park on Cape York Peninsula, Queensland. Vehicle Access: 4 wheel drive, high clearance vehicles are recommended whilst camper trailers and caravans regularly make the trip though experience has shown that all vehicles should be sturdy enough to cope with the rough roads. 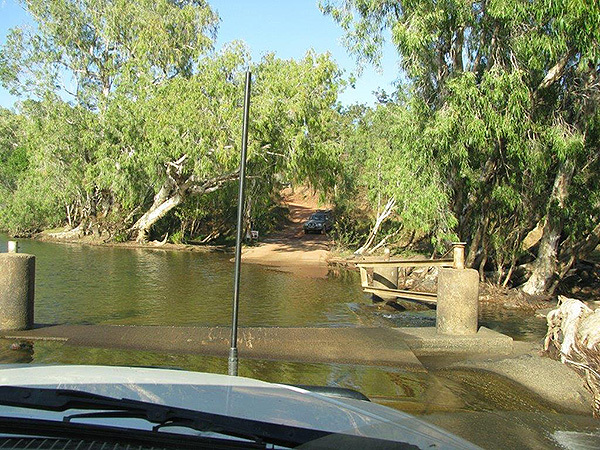 Unfortunately highway style motor homes and long (over 18 feet) caravans may experience difficulty in crossing some of the creeks so attempting to reach Pandanus Park in these vehicles requires careful consideration. 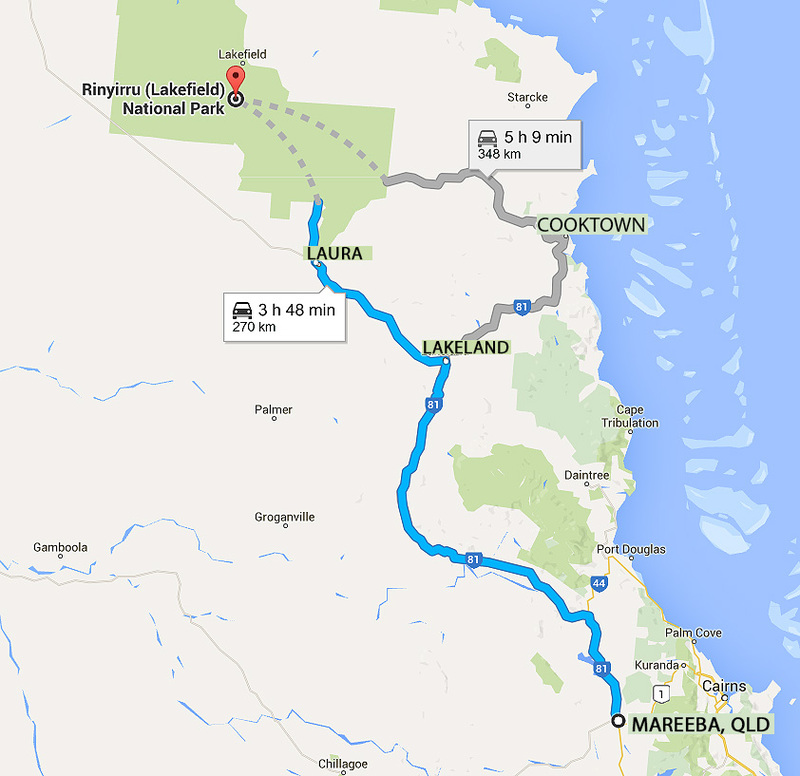 Access Route: Access to Pandanus Park is best achieved via Mareeba to Laura as this ensures bitumen roads to Laura. 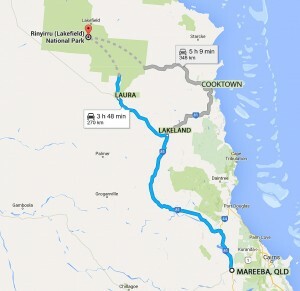 From Laura follow the road signs to Lakefield National Park and then the Kalpowar Crossing camp ground. From there cross the Normanby River via the causeway then drive the 17 kilometres of tracks to Pandanus Park. 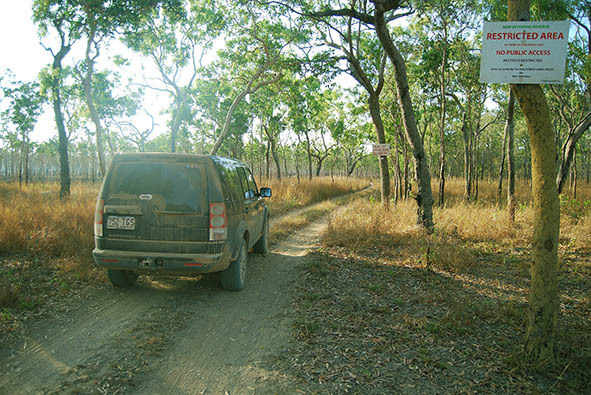 A longer but more picturesque route for 4WD vehicles without trailers is via Cape Tribulation and the Bloomfield Track to Cooktown then via the Battlecamp Road to meet the north-south road to Kalpowar Crossing. The causeway at the Kalpowar Crossing over the Normanby River will almost always have water flowing over it and whilst the causeway has a solid concrete base it curves markedly to the left. Please note that the base of the crossing may not always be visible. We recommend first timers either follow another vehicle across the causeway or use the cascading water on your left as an indication of the edge of the concrete. If in doubt do not cross and most certainly do not wade to check the crossing! Take care because the causeway is a narrow, single lane, crossing. 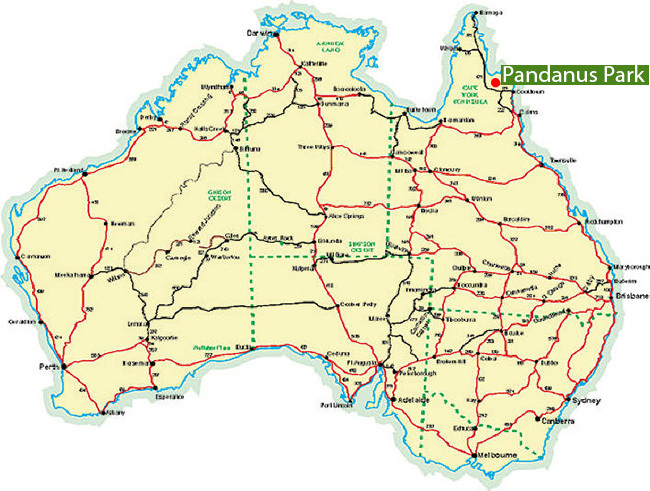 Pandanus Park is located in the top right corner of Queensland (red dot). 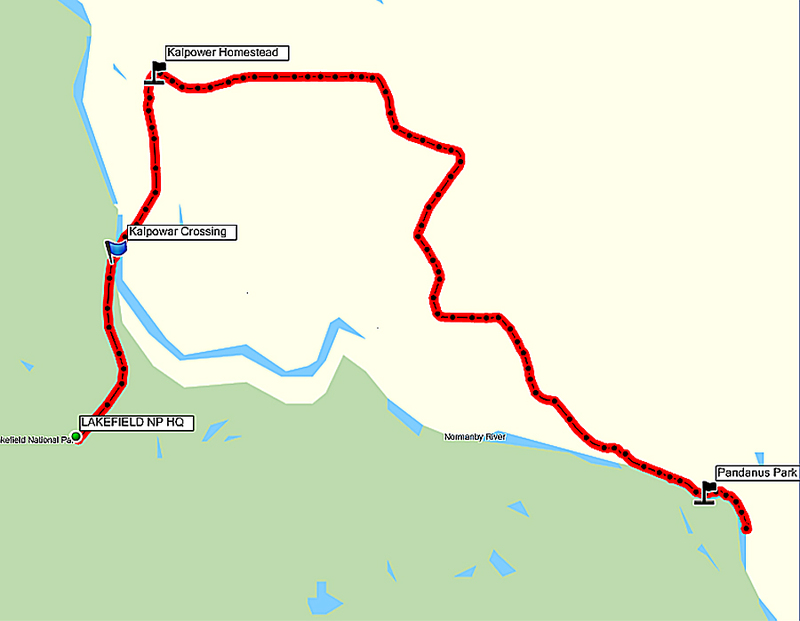 This map covers the 334 kilometres from Mareeba to the Kalpowar Crossing of the Normanby River. 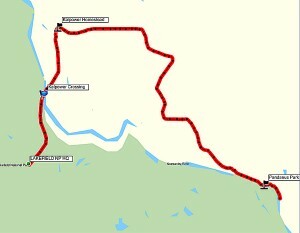 It follows the bitumen from Mareeba to Mt Molloy, Mt Carbine then on to Lakeland Downs (fuel) and finally on to Laura. 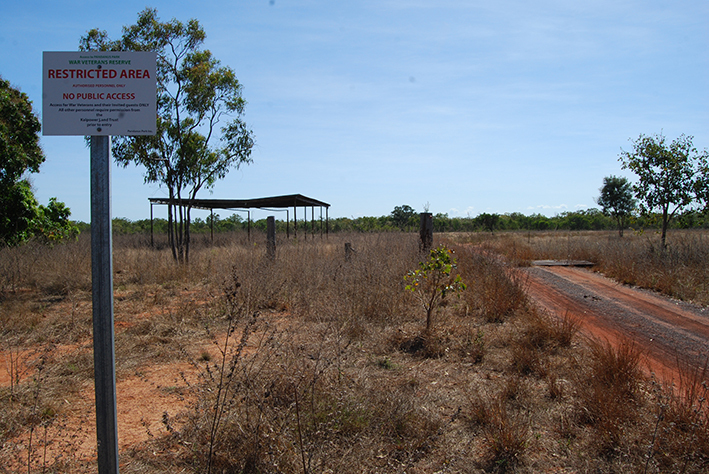 From Laura (the last fuel stop) the road becomes gravel of varying quality as it leads to the Lakefield NP HQ turnoff where Pandanus travellers will veer right to drive the final 2.9 kms to the Kalpowar Crossing of the Normanby River. IMPORTANT: Laura is the last refuel centre. You will need enough fuel to travel 103 kilometres EACH WAY (Laura to Pandanus and return) plus fuel whilst within Pandanus Park. Driving time: Approximately 5 hours. 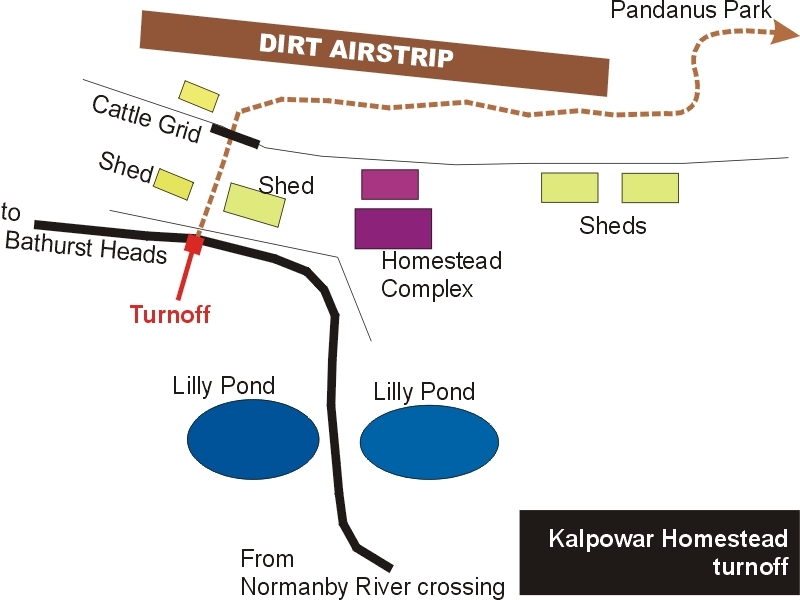 Laura to Kalpowar Crossing – gravel road of varying condition and can be very rough with bull dust, pot holes and corrugations. Drive this section with care. Less than 80kmph is about normal. Wandering cattle, narrow bridges, blind corners at the creek crossings, pot holes, dust. 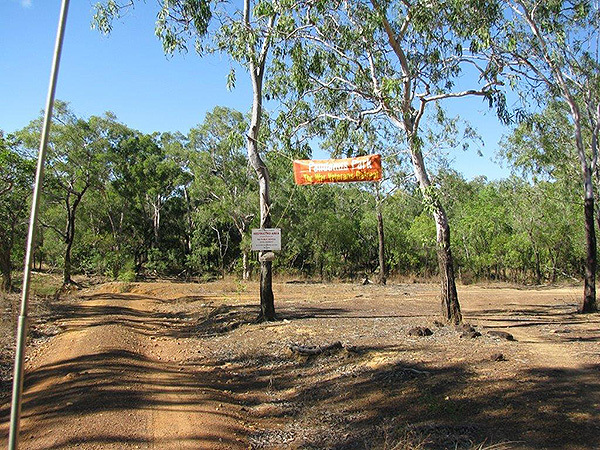 The last FREE toilet dump point is located on the left hand side of the road about 2 kilometres north of Mt Molloy township. Massive, humungous, hamburgers held together with three large skewers at Mt Molloy Cafe opposite the Post Office. The last fuel is at Laura General Store. Lakeland Downs also has fuel at the roadhouse on the hill. Mobile phone coverage is variable then non-existent beyond Laura. Saltwater or Estuarine Crocodiles inhabit all waterways north of Laura. DO NOT ENTER THE WATER. 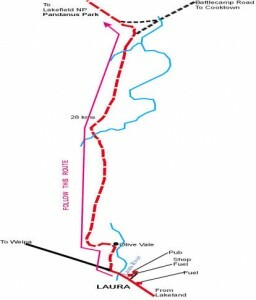 This includes Kalpowar Crossing. 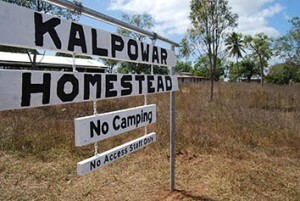 Note: Neither town has signposts indicating Lakefield National Park or the Kalpowar Crossing so follow these maps. 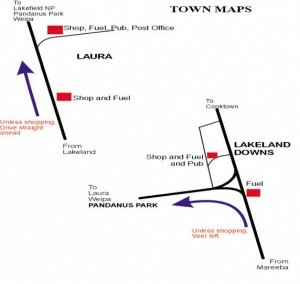 At Laura you continue straight ahead unless, as we recommend, you wish to top up with fuel. Laura is the LAST fuel stop before Pandanus Park. There is now a fully air-conditioned MOTEL at Laura opposite the general store and pub. See Harold at the General Store for bookings. 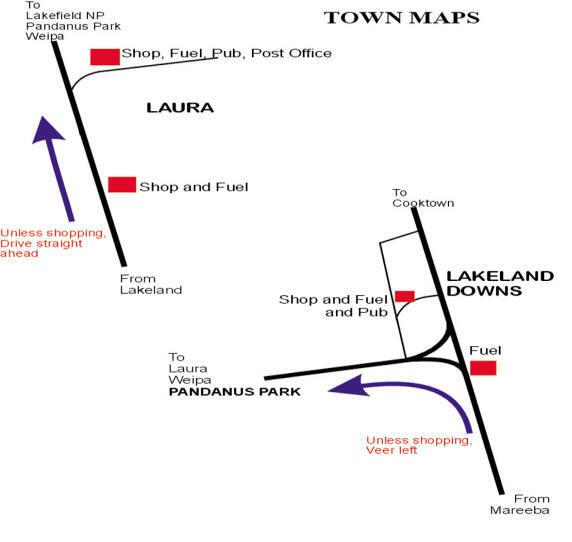 The Following map shows the junctions to be followed on the main road out of Laura as you head north. 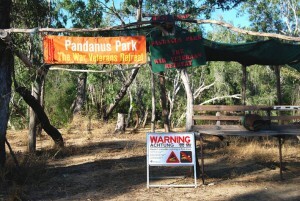 There are only two but they are NOT signposted to Pandanus Park so follow this map. Kalpowar Crossing north to Bathurst Heads and Cape Melville. 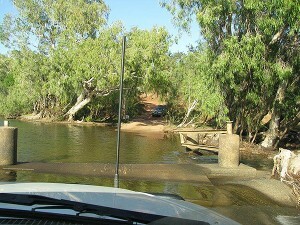 beyond the Kalpowar Crossing over the Normanby River. Pass through the main station gate which leads to the Homestead – Then swing left as you cross the lilly ponds. The homestead is directly in front of you then about 100 metres further on TURN RIGHT at the homestead sign. If the gate is locked please visit the homestead and politely ask for the key. If the gate is closed then re-close it after you pass through. DRIVE SLOWLY through the homestead area to reduce the dust hazard for the homestead occupants. Pass through the gate next to the large shed,then drive straight ahead and cross the steel cattle grid. Cross the cattle grid then follow the track as it swings right. 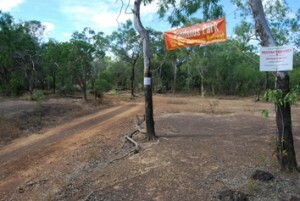 From hereon follow the track past the large gravel pit then swing left and then right Then continue along this track for 13.5 kilometres which will seem to take forever for first timers. DO NOT TURN OFF THE TRACK. through Kalpowar Station (please note that Kalpowar Station is private property) to Pandanus Park. The road is formed gravel from the river crossing to Kalpowar Homestead and from thereon becomes a two rut bush track. Take care on this single vehicle width track.